A template is a combination of HTML elements, controls and embedded server controls, and can be used to customize and manipulate the layout of a control. ASP.NET provides three server controls for displaying data in a customized layout: Datagrid control, Repeater control, and Datalist control. The layout for these controls can be customized using templates. For example you can use a template to customize the layout of the individual rows. Alternating rows, or selected rows of control. At runtime, the specified template is rendered on the page. There are different portions of a control, such as the header, footer. item and separator, which you can customize according to your requirements by using templates. There are different types of templates available depending on the portion of control for which the template is defined. Represents the collection of elements and controls that are rendered for every alternating row in the data source. Represents the collection of elements and controls that are accessed one time after all the items are accessed in the control. Represents the collection of elements and controls that are rendered when an item in the server control is in edit mode. Represents the collection of elements and controls that are rendered between each item. 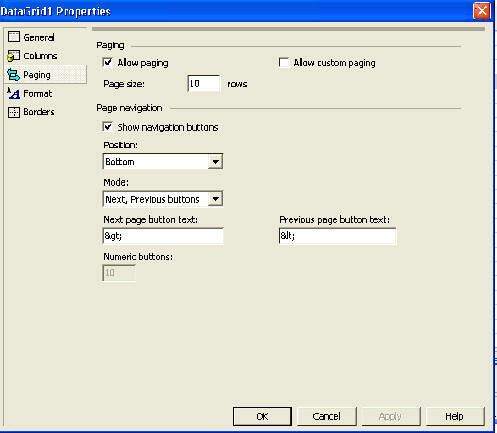 You can create and edit a template for a server control either by using Visual Designer or by editing ASP.NET code. When you use Visual Designer, the corresponding ASP.NET code is generated automatically. Now we will be discussing the process of creating and editing templates in detail, in these sections of the Repeater, Datagrid and Datalist controls for which these templates are used. Drag a Repeater control to the Web Form and write the code to bind data to a datasource. You can download the project from the link given at the end of this section and view this code in the load event of the Web form. It is to note here that, to display the rows from a datasource in the individual items of the any of the data controls, you need to bind the embedded controls with the datasource of the container control. To accomplish this, you need to use the DataBinder.Eval ( ) method. ContainerName: Represents the container for a data item. For example it cab be a page. For Repeater, DataList and DataGrid controls, this parameter has the value Container.DataItem. DataFieldName: Represents the name of a data item field. FormatString: This parameter is optional.. Represents the format of the bound data item. It can contain values such as the format character 'N' for the number format and 'd' for the short date. If this parameter is not specified, the data item is formatted to a value of the object type. You can download the example Control Templates project through this link. This is very much like the Repeater control, except that it has some additional properties and templates. These properties and templates of the DataList control allow you to display its data in a diverse way. The DataList control displays data from a data source in a form of a list. It also provides data selection and editing capabilities. A DataList control also has the RepeatDirection and RepeatColumn properties, which provide the layout of the data in the horizontal and vertical direction. The available list of templates is displayed. These are divided into three groups, Header and Footer templates, Item Templates and Separator templates. Select the Header and Footer template option and the DataList control is displayed in the edit mode. The default layout of a DataList control displays data in one vertical column, but you can specify multiple columns for displaying data by setting the RepeatColumns property. You can specify the order of display as either vertical or horizontal by selecting its RepeatDirection property. The RepeatLayout property of a DataList control can be used to specify the type of layout for displaying data in the control. The flow layout displays the list of items in a word processing document format and a table layout displays the list of items in a HTML table. The DataGrid control offers all the functions of the DataList control and, in addition the control provides sorting and paging capabilities. Its AllowSorting control provides sorting and redisplaying data on the selection of a column header. 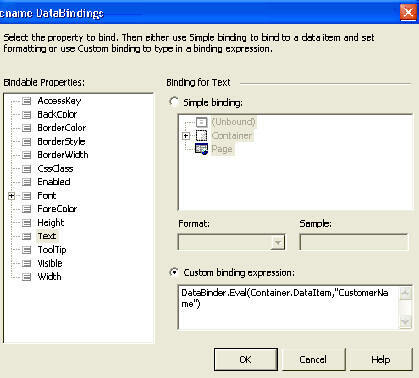 A selected page of data can be displayed from a large data source by using its AllowPaging property. Enable paging of the datagrid control by setting its AllowPaging property to True. Assign a value to the PageSize property to specify the rows that you want to see for each page. Make sure the data source bound to the datagrid control is refreshed whenever you scroll back and forth. The datagrid raises the OnPageIndexChanged event whenever you click the pager to jump to a certain page.